Brilliantly embossed with a feminine touch, Abigail is a classic take on whiteware. A perfect touch of delicate elegance for your wedding and event tablescapes. Abigail White Salad/Dessert Plate 8"
Abigail White B & B Plate 6.5"
Abigail White Coffee Cup 8oz. 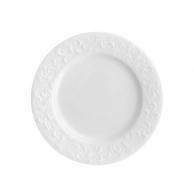 Heirloom Linen Dinner Plate 10.75"
Abigail White Soup Plate 9"